I would like to purchase the Heavenly Heat, but you said the EMF was higher than expected. Do you recall what the numbers were? Lisa, thank you for your quick response. I’ll call Bob and see what he has to say. Thank you for all the info about saunas. Are you still enjoying your sauna? My one concern with this sauna is that we may move within a couple years. You mentioned the difficulty/time involved in putting the sauna together. What about taking it apart, and will the sauna screw holes hold up (not be stripped or wood cracked) with having to be taken apart and put back together again? I’ll ask Bob the same question, but I would like your thoughts if you have time to respond. Appreciate you taking the time to comment, Steve. I do not know about Dr. Rogers’s situation and hope to have the opportunity to ask her personally one day. IMHO, health experts who recommend products should make the time to vet their recommendations and evaluate competing products if possible, especially if receiving a few hundred dollars per referral as some do. I have no affiliation with any sauna company nor opinion on what saunas others chose based on their criteria. 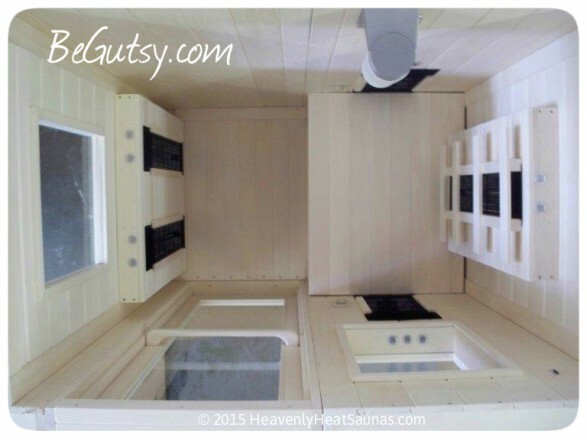 From what I know, Heavenly Heat’s Eco1 is easy to put together like the sauna you purchased, but does not use the glue and is not made in China. Those were a few things that were important in my decision-making process. However, taking the time to test magnetic fields and electric fields (EMF), even if the company says they have low EMF, is a worth-while thing to do as well! information was frequently mixed with salesmanship. And many products ended up made in China, the last thing I want. Plus I like high temperatures. I went with Heavenly Heat. Thank you for the kind words of encouragement, Michael! If you have a one person sauna, I recommend measuring the electric fields and magnetic fields with a meter or hiring an EMF specialist to do so. As the late Hal Huggins said “detoxification = re-toxification”.